So we seemed to have accidentally discovered the most beautiful part of New Jersey, and then one of the ugliest parts of Connecticut. The surrounding area wasn’t ugly at all, but we booked a campground that was an expansive property that mostly hosted mobile homes, or permanent RV sites where the trailers sat vacant for most of the year. It was at this place where Sunny got her first tick, and the smell of sewage mysteriously wafted through the wind every night about 8:30pm. We’ve seen lots of capitol buildings as we’ve driven through all of these states. 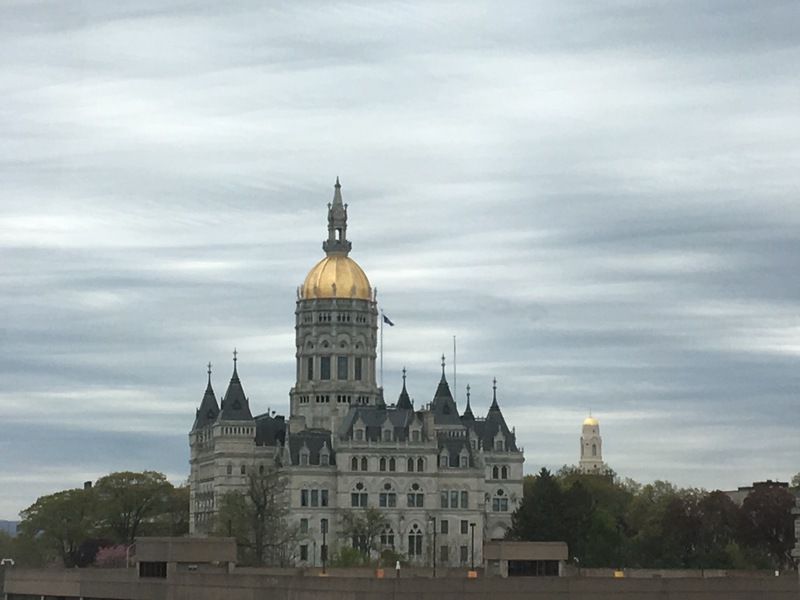 Here’s the capitol in Hartford, Connecticut. This quick snapshot I took from the truck window is the only picture I have of Connecticut. We drove through miles of springtime forests divided by stone fences built by previous generations to visit Rhode Island from this campsite. We spent the day exploring Providence, which was a beautiful small city. The old buildings and churches gave it a charming feel, it’s clean streets were a refreshing change of pace from NYC, and in a small french cafe I had possibly the best mocha that I’ve had in my entire life (and I’ve had a LOT of them…). So we really enjoyed checking out downtown Providence. We explored a lot of sculptures and monuments in downtown Providence. The girls loved this one where you could be a butterfly. We stumbled upon an interesting looking building called the Atheneum and meandered inside to investigate. It turned out to be a lovely old library that looked like something straight out of Indiana Jones. 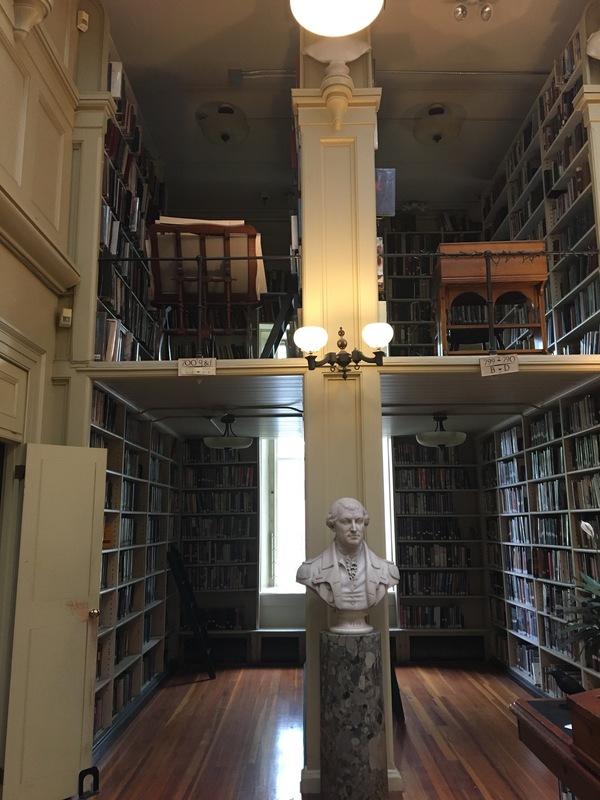 There were Greek statues and busts on oversized tables, rolling ladders to reach higher shelves, second floor salons with study nooks, old card catalogs, and copies of Stewart’s George Washington paintings on the wall. 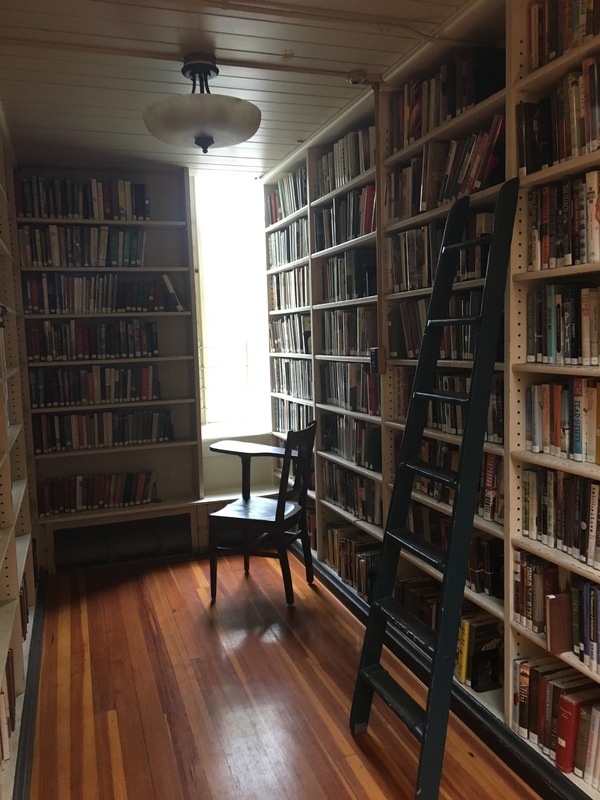 I really wanted to climb the shelf ladders and go sliding across the shelves, maybe singing a big chorus from a Disney movie or something like that. Instead we just enjoyed the children’s section for awhile. Our girls have requested a 2 hour minimum on all library visits, but unfortunately we didn’t have that long to spend here. 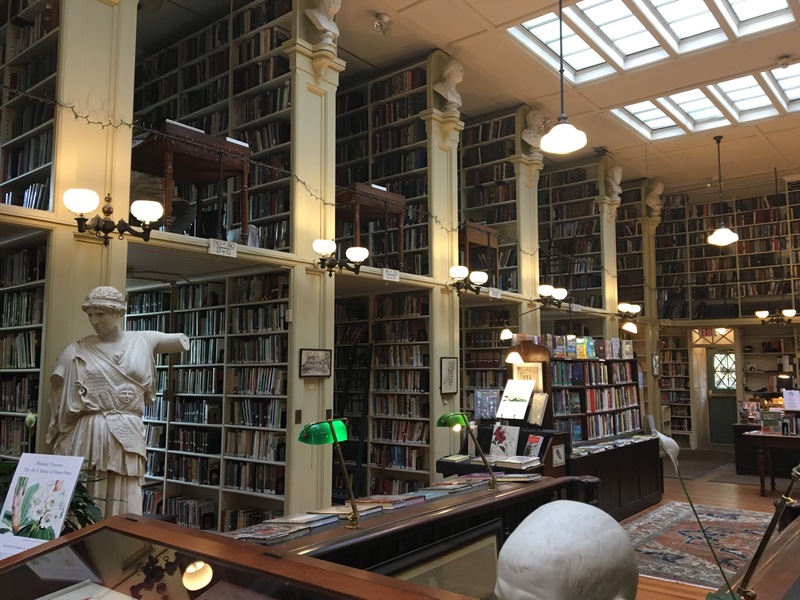 The beautiful Atheneum library in Providence. It felt like walking into a different era. This would be a great place to spend an entire afternoon. 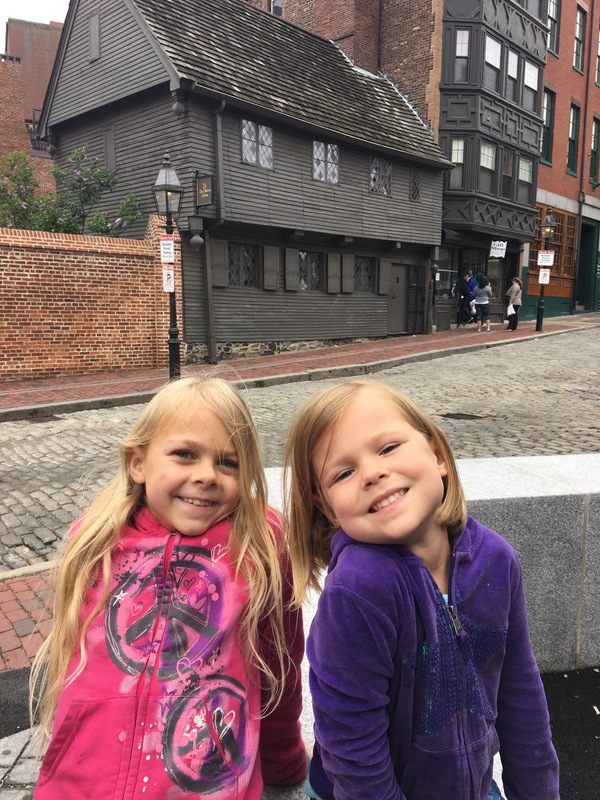 The girls and I left Brad in downtown Providence so he could get some work done, and we continued east to Plymouth Rock, Massachusetts. My family can trace our lineage back to William Brewster and his family who were on the Mayflower. So not only was it fun to check out this important historical place, it was also personally meaningful to feel connected to what happened here. At the Pilgrim’s Hall Museum we went on a personal scavenger hunt to find Brewster family belongings. We were in luck, because he was an educated minister, a printer, and his entire family survived the first winter (they were in the lucky 50%) so there is actually quite a historical footprint left from his family. I was so excited to see this historically and personally significant site. 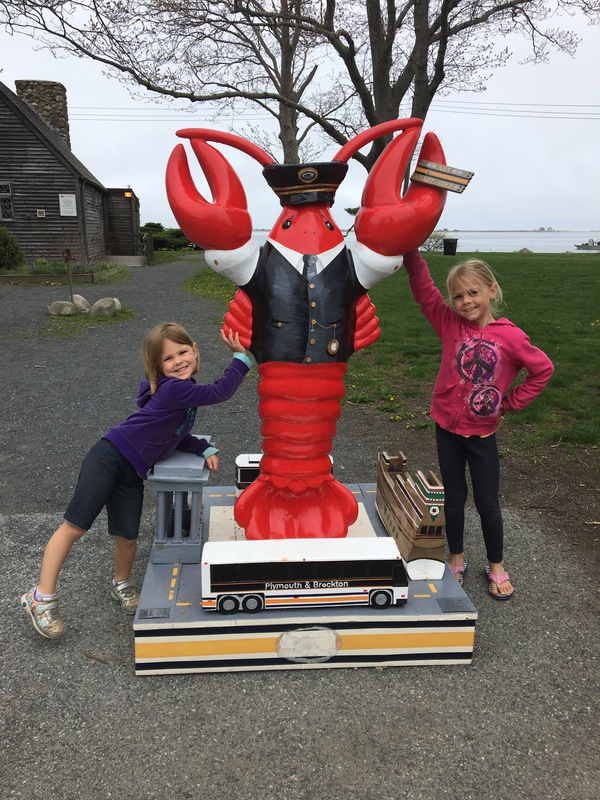 The girls were more excited about the giant painted lobsters all over town. There it is! 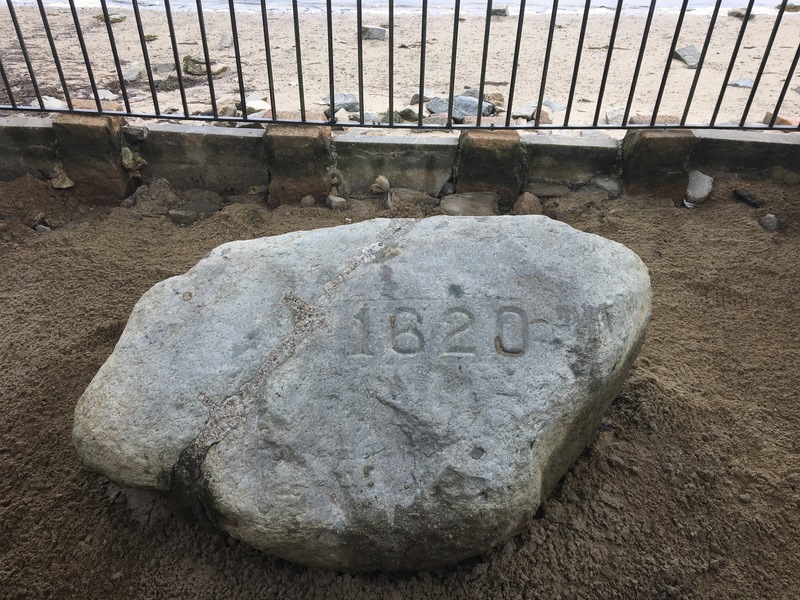 THE Plymouth Rock…a fraction of the size of the original bolder due partially to natural erosion, and largely to people chipping parts of it off over the centuries. As the girls and I have read through our American History book this spring (which I would totally recommend and I’ll share more about later in a post about our Road Schooling experience) I have really been struck with how the victors decide how history will be told. I first started really mulling this over when Sunny asks about a war, “The good guys won, right?” These questions lead to really good conversations about the potential for good and evil within all of us, but also about the political slant of everything we’ve been taught about our own history as a country. 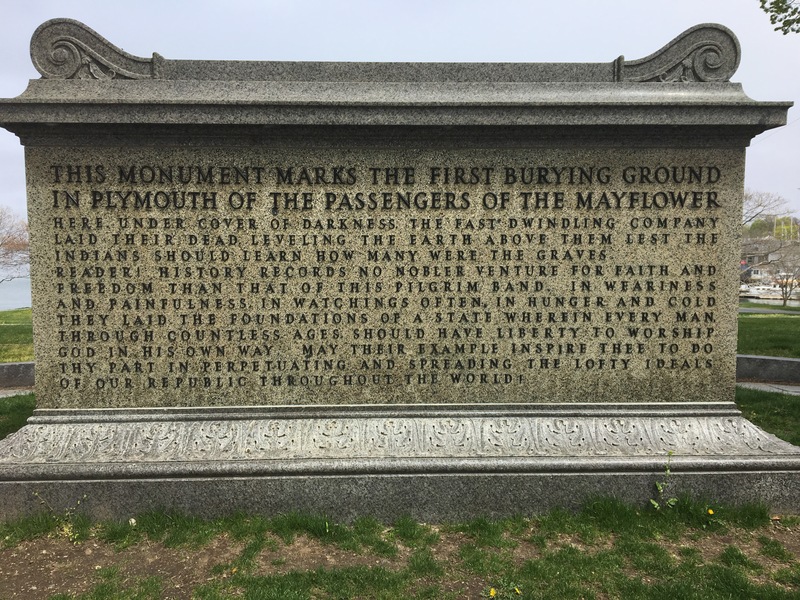 Our history book does a great job of telling stories from multiple perspectives – Native Americans, European immigrants, enslaved people from Africa – but none of it hit me like the plaque that described the “Day of Mourning” at Plymouth Rock. On a small hill that overlooks the landing place of the Mayflower, there are many monuments and statues. 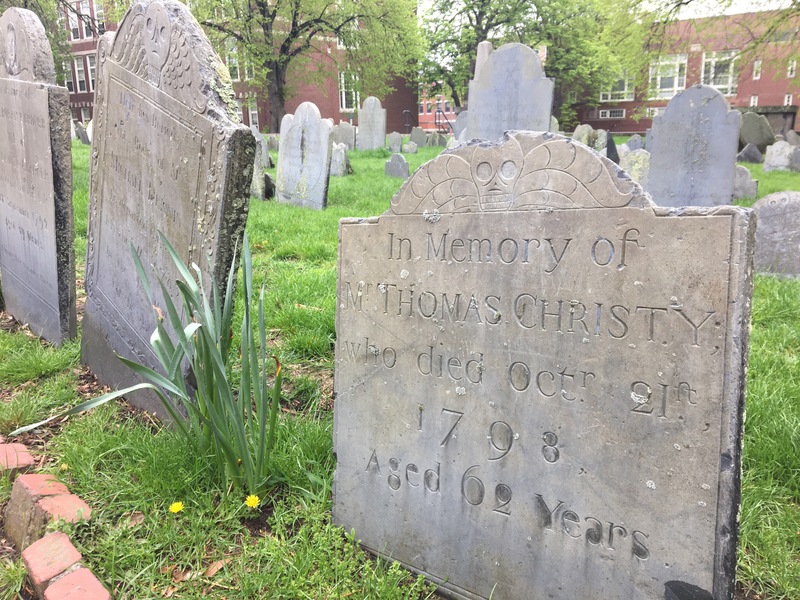 We saw William Bradford, the new town’s governor and historian, the Native American chief Massasoit, and even a crypt which contains the bones of the 51 Mayflower passengers who perished during the first winter out of the original group of 102. But in the middle of all of these sites there was also a small, nondescript plaque on a gray stone that told about The Day of Mourning. Every year on the last Thursday in November, when most of us are celebrating Thanksgiving, a group of Native Americans meet on the hill to remember what would become the beginning of the end for their people’s years of thriving in North America. 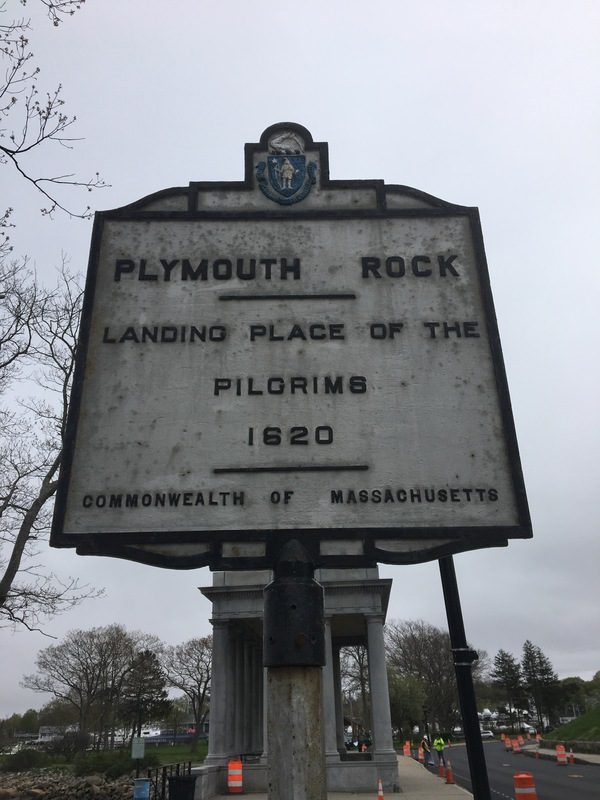 So as much as I left Plymouth Rock with a sense of pride that my grandfather’s name is splashed all over town – street names, parks, etc. – I also left with a complicated sense of the fact that my ancestors were among some of the first Europeans to arrive and begin the exploitation of the native people groups. I like knowing that the Plymouth Rock settlers had much better relationships with their native neighbors than many who came later, but it’s little consolation if you fast forward through the next 300 years and consider all that happened. I take my responsibility of passing this information down to the next generations very seriously, and I appreciated getting a history lesson from multiple perspectives during this visit. 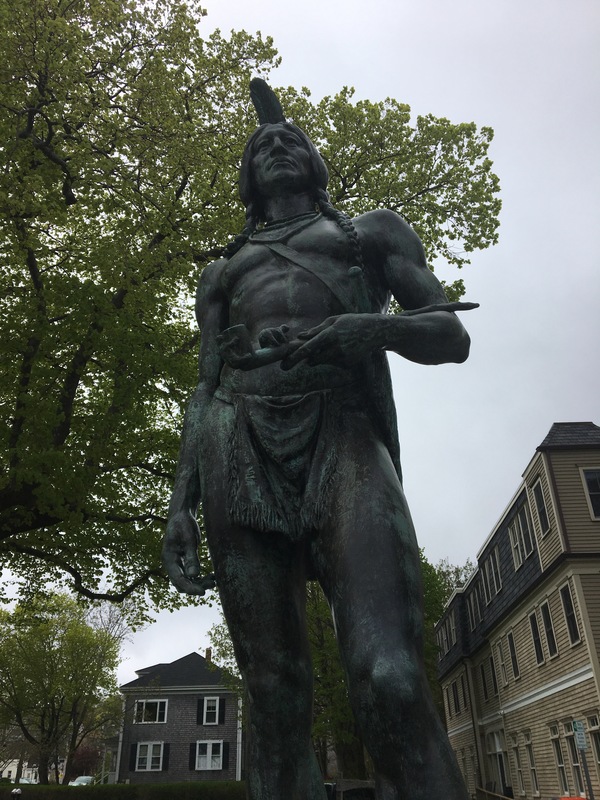 Statue of Massasoit, leader of the Wampanoag, on Cope’s Hill overlooking the Mayflower landing site. Grandpa Brewster’s Chair! The plaque next to it in the Pilgrims Hall Museum read: “Brewster Chair” turned Great Chair. 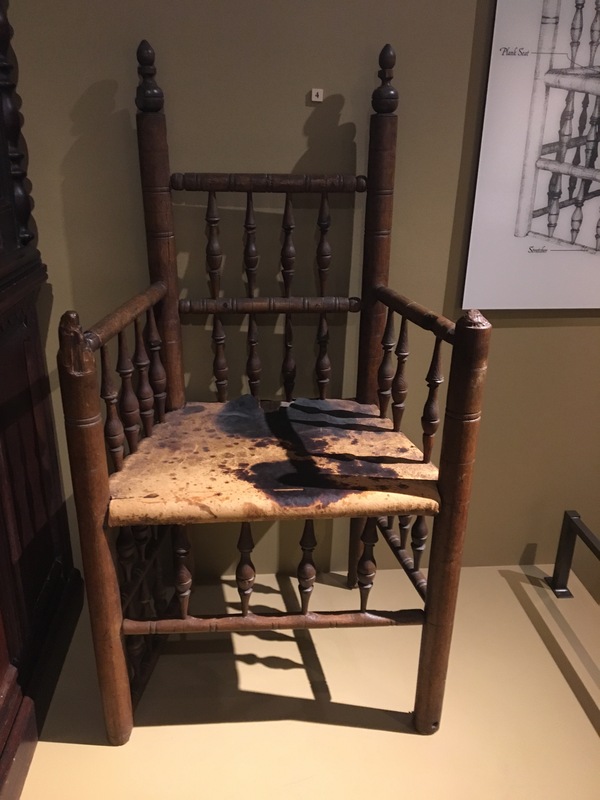 This chair probably belonged to William Brewster, the spiritual leader and one of the most educated members of the colony. “Great chairs,” like the Brewster Chair and the very similar Bradford Chair generally belonged to “great men,” with authority and standing in the community. When we got back to our truck which was parked in a completely empty parking area designed for the demands of the summer tourism but was not yet awake for the season, I found a parking ticket. The meter had expired. I felt a little bit like I should consider marching into the police department with the ticket and insist that my Great (x13) Grandfather had founded this town, and so technically I kindof owned it, and demand that the penalty be waived. I decided against it. We drove back through Providence to scoop Brad up after his afternoon of working and meeting up with college friends. We stopped at a neighborhood park where the girls could play after multiple hours in the truck and Brad could run a local trail. While Brad ran the trail up the hill, we sat in the grass to complete our Rhode Island geography page, and then I sat near the playground while the girls played. The playground was completely overrun with a mob of kids; the girls were having a blast but I was cautious. It felt like someone was about to get hurt. There was a creepy ice-cream truck parked next to the playground, and I watched as numerous little kids walked back into the play area with giant, cold treats, just to rip off the enormous packages and drop them to the ground of the playground. On the skate park next to the playground there was a very loud group of older kids who kept yelling things I didn’t really want my small children to overhear. And in the other direction, a pick-up basketball game turned into a bunch of boys playing with firecrackers for awhile, startling me several times. When Brad came back from his run he said it was a very rough trail – homeless camps in the woods, old rusted cars becoming overgrown next to the path, a guy driving around the pedestrian only areas in a loud ATV, trash everywhere, and even human excrement on the trail. 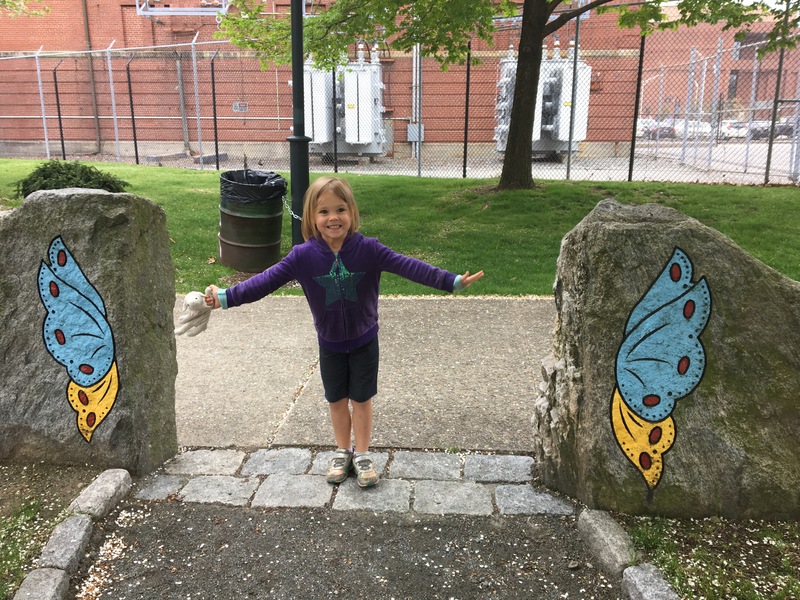 As we drove back to our campground in Connecticut, we talked about how our morning experience in downtown Providence was very different from the picture of the city that we got from the park in the afternoon. These snapshots can create such a lasting impression, but they are really only the feeling you get from a very brief moment in a specific place. The next day we made the long jaunt into Boston to explore the Freedom Trail. 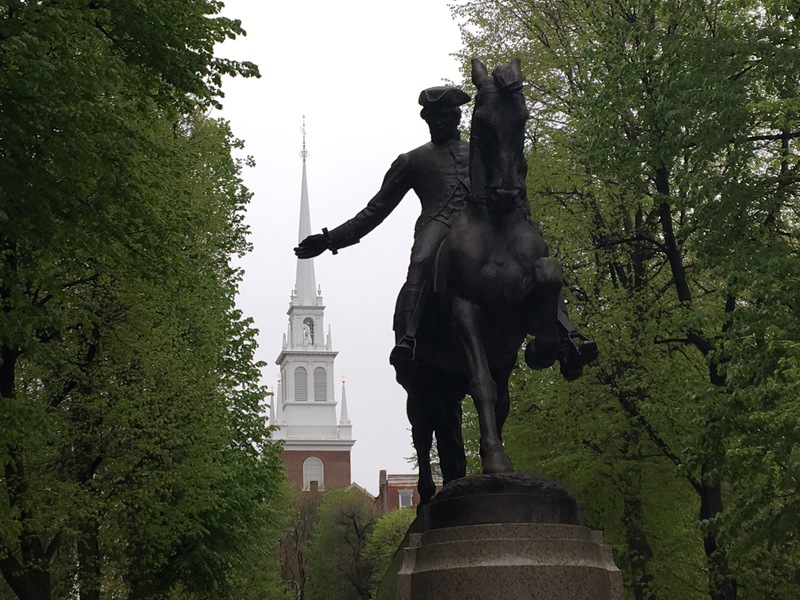 In our history book we had read about Paul Revere and the beginning of the Revolutionary War, so this was another fun chance to see the places we had learned about. 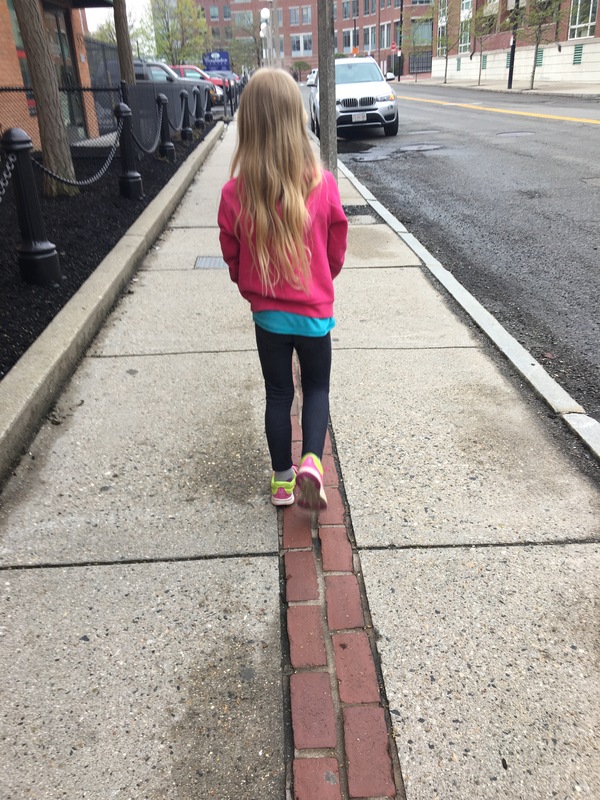 We followed the red brick Freedom Trail all over the historic parts of Boston. 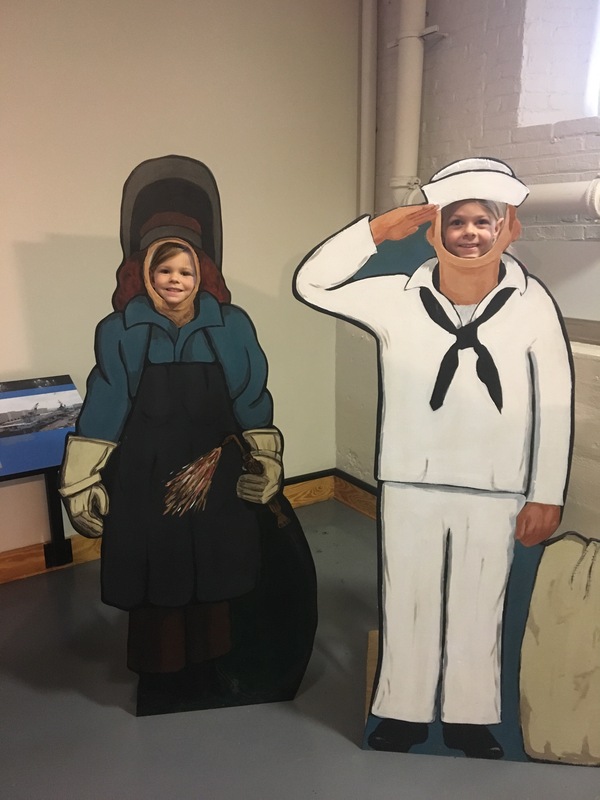 The tour began at the USS Constitution and Charlestown Navy Yard. Lots of very old burying grounds with fascinating tombstones. So man depictions of skulls and grim reapers! We had lunch in the market place next to this important, upstairs meeting room in Faneuil Hall. 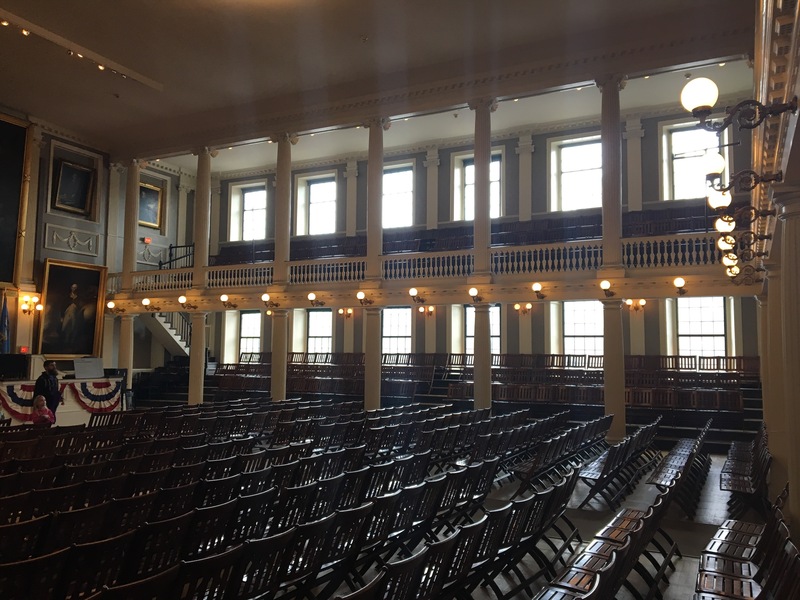 I think it’s very meaningful that “this imposing structure is the place where the Sons of Liberty proclaimed their dissent against Royal oppression” and to this day hosts American Citizenship ceremonies for hundreds of people each year. 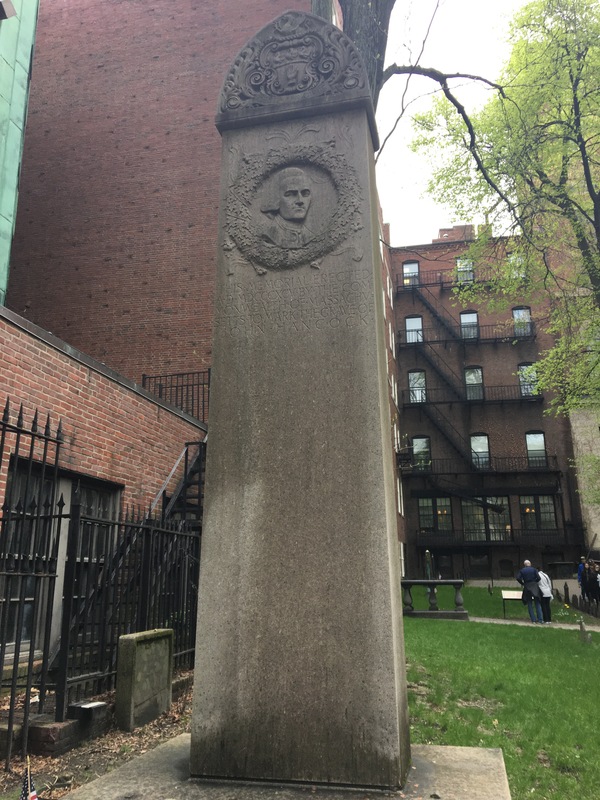 This is John Hancock’s tombstone. I’ll let you draw your own conclusions. B: Was my bike in the back of the truck this morning? B: Well, it’s gone now. 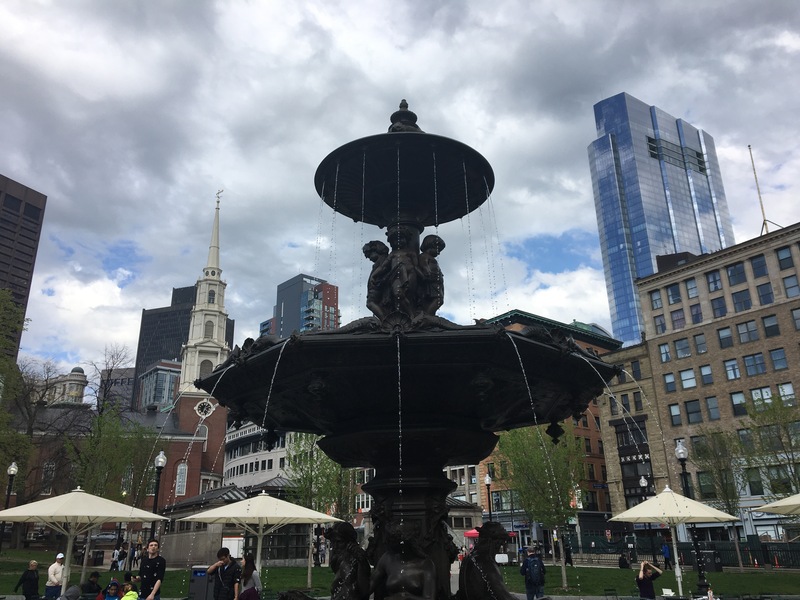 The city of Boston is a constant juxtaposition of old, historically-significant monuments to the way things once were, and stunning, modern feats of architecture promising a steady march of progress and development toward the future. From the Brewer Fountain in Boston Commons, you can see Park Street Church in the background as well as modern skyscrapers. 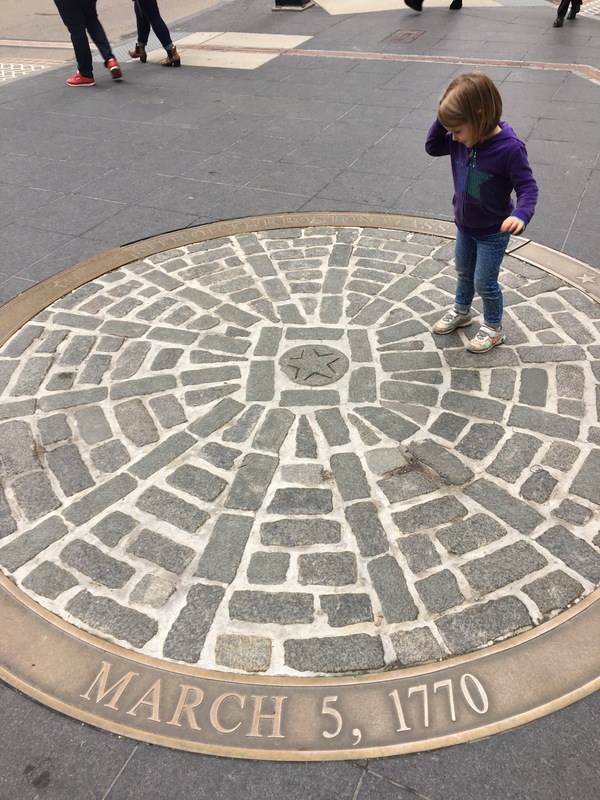 That night as the girls were crawling into bed I asked my usual question after visiting an important site, “Was Boston like you expected?” And I always get the same answer: an emphatic, “No!”. Sunny explained how Paul Revere’s house was much smaller and more plain than she thought it would be. “Oh, me too, Sunny,” Coral chimed in. “I thought it would be more like Mt. Vernon, didn’t you?” Oh, these girls. 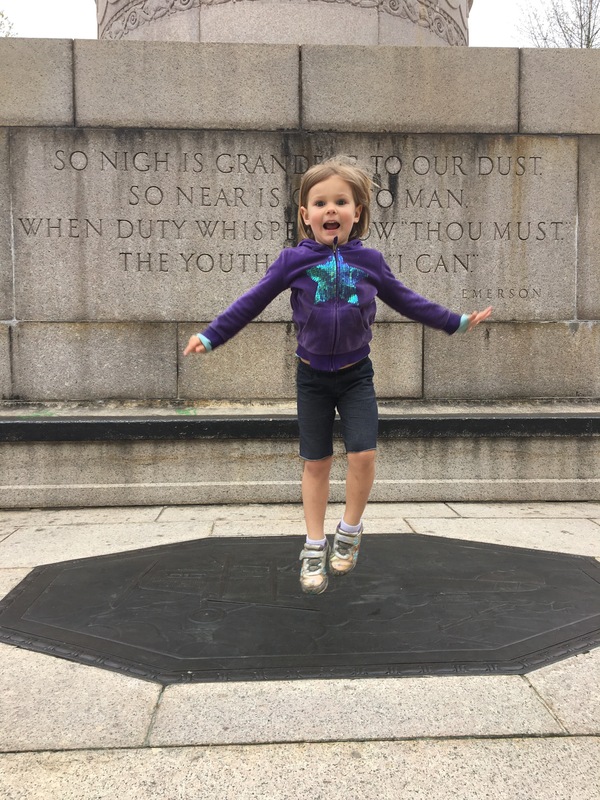 I’m so delighted by all of the things they are learning, even if they usually refuse to record it in their travel journals to my liking. Brad and I have had a lot of discussions about how small moments can make such a big impact on an individual’s experience, that it’s easy to think of a whole region as one way or another based on specific, insignifcant instances. A hair stylist in Pennsylvania commented to me that “people from Georgia are the nicest people in the whole world.” When I pressed him for why he thought so, he told me the story of eating at a burger place on a road trip through the area, and his waitress was over the top nice in every way. “Maybe you just met the nicest person you’d ever met, and she just happened to be from Georgia,” I suggested. He agreed that this was also possible. One of our cousins has the impression that people from the northwest are exclusive snobs because of one unfortunate interaction she had with a couple from Seattle that just sounded like random jerks. So we take these lessons and we try to apply them to ourselves on this adventure. I know that just because I met a grumpy lady in Appalachia, it doesn’t mean that people from western North Carolina are rude. I know that our one strange, back-woods campground didn’t represent the entire state of Connecticut any more than my delicious Cafe La France experience is the epitome of Rhode Island. I would rather forget the sketchy park experience in Providence and the fact that I got a parking ticket in Plymouth Rock. But even after the details of such events fade, the emotional memories are not easy to forget. So what can I say…people from Boston are all just a bunch of bike-stealers.